Derived Table is a sub-query used as a datasource for the main query. To add a derived table, you should right click the Query Building Area and select the Add Derived Table item from the context popup menu. 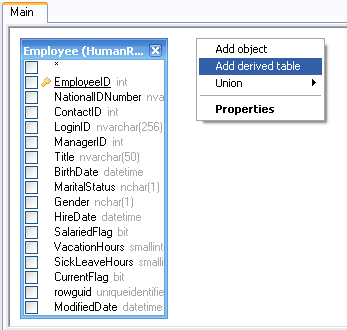 A new object representing the newly created derived table will be added to the query building area, and the corresponding tab will be created for it. This tab allows you to build it visually in the same way as the main query. Another way to switch to the corresponding derived table tab is to right click the caption of an object representing the derived table and select the "Switch to derived table" item from the context popup menu. 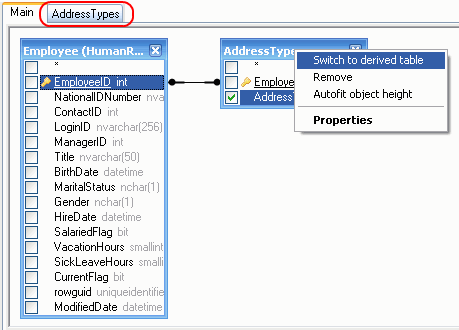 You can set an alias for the derived table the same way as for ordinary database object. You can always go back to the main query and switch to any sub-query or derived table using tabs above the Query Building Area or using the Query Structure Tree.